Do you sometimes feel that the kids use you as a plaything? Constantly climbing over you, pulling at your clothing, wanting to be held. This curious contraption may raise a few eyebrows, but kids are sure to love it. Ladies and gents, introducing the wearable rope vest. 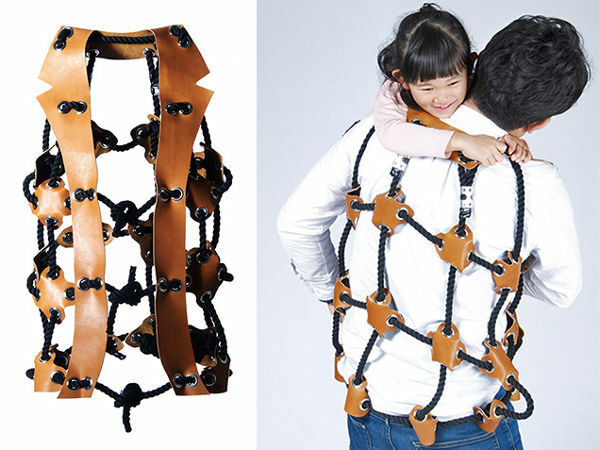 The AthleTitti rope vest was dreamt up by a graduating Tama Art University student in Tokyo. It’s designed to give kids a physical outlet, while directly involving the parents. It’s also probably the safest way for kids to learn to climb. What do you think, genius or nonsense? If this rope vest takes your fancy, you’ll love the Car Play Mat t-shirt we’ve previously featured.